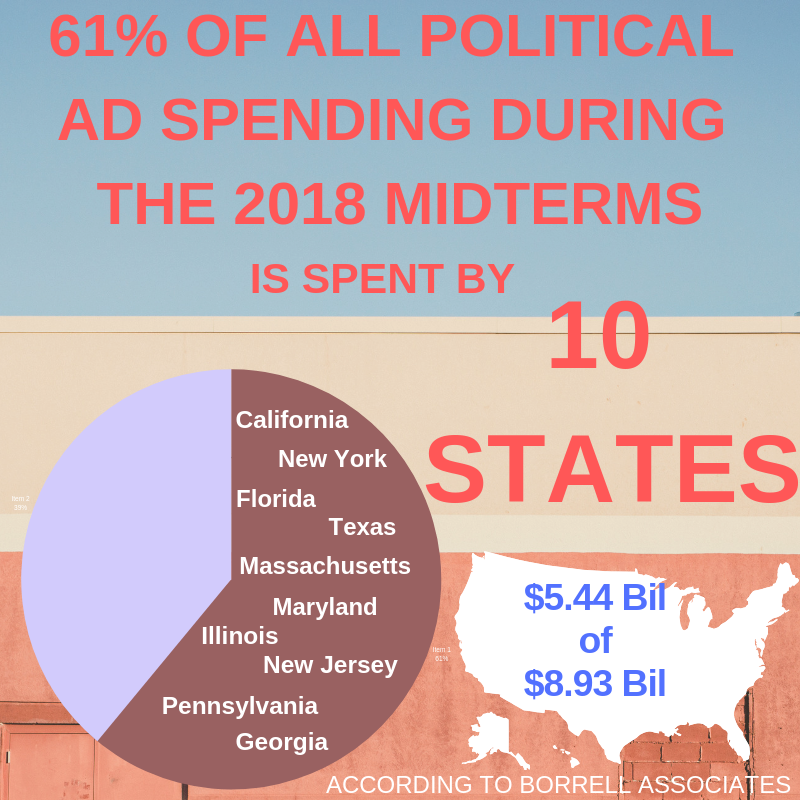 Political advertisements bombard voters during election seasons and according to Borrell Associates, a projected $8.93 billion will be spent on political advertisements during the 2018 midterms. I’ll be speaking with Gordon Borrell, CEO and owner of Borrell Associates. Borrell’s report breaks down the spending by state with the top 10 states taking up 61 percent of the total political advertisement dollars, totaling $5.44 billion. Georgia is in the top 10, projected to spend $253.8 million on political advertisements this election season. Why it is newsworthy: A projected $253.8 million dollars was spent solely on political advertisements in Georgia during the 2018 Midterm Elections. Political advertisement spending is only a small portion of a campaign’s total budget. Borrell Associates released a projected political advertisement spending report for the 2018 Midterms to make campaign spending more transparent. Justin Strength, campaign manager for Georgia House District 119 member-elect, Marcus Wiedower, said that of all the money their campaign raised, only 40 percent went towards advertising. Strength mentioned the Wiedower campaign’s advertising included direct mail, radio and television ads, television production for ads, as well as social media. Midterm elections typically have less voter turnout than presidential elections, however more money has been spent this election specifically on political advertisements than in previous elections. Many attribute this increase in advertisement spending to the polarized political climate we have today. Candidates need to get ads out on every platform to reach the most voters, which increases spending. Borrell Associates released an updated political advertisement spending forecast report in August of 2018, the original report was released in April, but campaign advertisement spending in races all over the country was increasing so much they had to redo the entire report to reflect the increase. Political advertising in the digital age is even now changing at a rapid rate. Digital ads are much more appealing because they can be targeted so distinctly to viewers. I want to thank Gordon Borrell for taking the time to speak with me about the current trends in political advertisements and what is to come. Emily Graven is a senior journalism major within the Grady College of Journalism and Mass Communication.